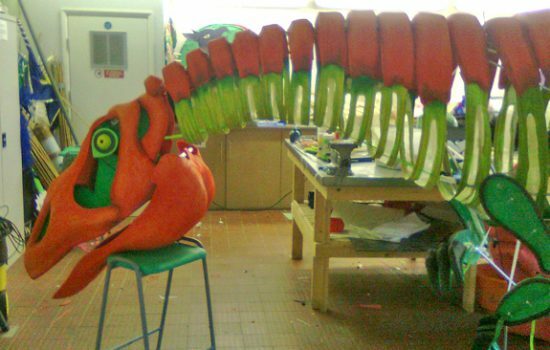 Design and Production of two dinosaurs with Ceremonies Artistic Director Sharon George in 2011. 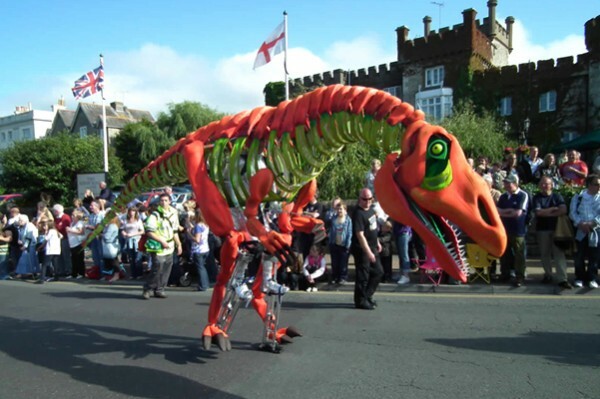 Neovenators, a predatory dinosaur first discovered on the Isle of Wight were chosen as leading characters in a historical timeline Parade for the Island Games Ceremony. They were worn by one stilt performer each and were made in a 2 week workshop which I led in the Carnival Learning Centre in Ryde. My concern as ever was to get as much character and dynamism from our creatures as possible. So weight and balance were crucial. The body was divided into segments like a children’s wooden toy and made from foam and quilted fabric. This all hung off an aluminium frame core with backpack mounted inside. 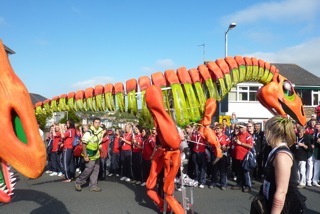 The legs hinged of this and were dressed to the base of the stilts. 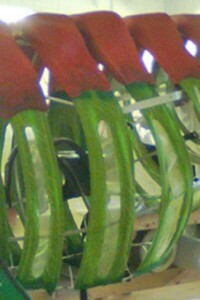 Control rods were connected to the claws and housed a brake lever which operated a snapping mouth. Structure and workshop assistance from Pete Allen. I was worried about wind and steep hills, but our mischievous pair survived and continue to roam the streets.